Weed Management Options: Why Reduce Pesticide Use? Pesticides are used extensively in Canadian cropping systems. 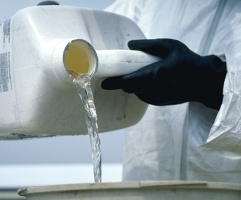 CropLife Canada reported pesticide sales of over $1.3 billion in 2005 (CropLife Canada, 2006). Of this, 78% was spent on herbicides, 10% on fungicides, 4% on insecticides and 8% on specialty product sales including seed treatments. Pesticides applied to field crops (cereals, oilseeds, pulse crops, and corn) accounted for 74% of all pesticides sold in 2005. The "pesticide treadmill". Heavy reliance on pesticides and fertilizers has allowed farmers to adopt simple crop rotations. Use of simple cropping systems keeps farmers on the "pesticide treadmill", where increasing amounts of pesticide and fertilizer inputs are required to keep the system going. Rising input costs. Input costs are continually rising, resulting in decreasing net return to farmers. In fact, the on-farm economic return for every dollar invested in synthetic inputs has declined over the past 20 years. Pesticide resistance. The frequency of pesticide resistance is increasing and availability of existing and new pest control options is decreasing. Environmental effects. Pesticides are designed to be toxic, and can harm non-target organisms including wildlife, pollinators (bees), native plants, soil micro-organisms and sensitive non-target crops. The potential for environmental effects is not limited to the site where pesticides are applied, as some substances are able move long distances through the environment if they become airborne or reach water sources through leaching or run-off. Health concerns. Although pesticides in use in Canada are strictly regulated, there remain concerns among consumers and others that exposure to pesticides could be linked to cancer and other health issues. Farmers or others who apply pesticides have a high risk of exposure to these chemicals during their preparation and application. CropLife Canada. 2006. Annual report 2005/2006.